SHAH PORIR DWIP (BANGLADESH) - Rohingya refugees arriving in Bangladesh amid a fresh exodus from strife-torn Myanmar have described whole villages being emptied and thousands marching to the border as security forces redouble efforts to drive the remaining Muslims from their homes. The spike in new arrivals -- prompted by what Rohingya say is a fresh drive to purge Muslims still in westernmost Rakhine state -- casts doubt on a Myanmar proposal aired this week to start repatriating the persecuted minority. 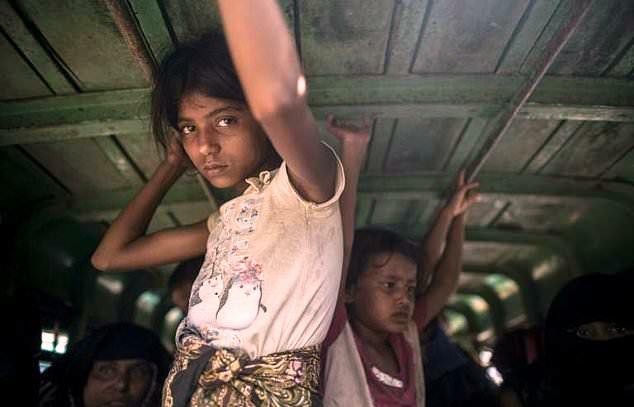 Rakhine has been emptied of half of its Rohingya population in weeks, and more are on the move as insecurity presses them to leave villages which have so far been spared the worst of the communal violence ripping through the state. "(But then) the army came and went door to door, ordering us to leave," she told AFP of the military sweep in Maungdaw on Friday. "They said they wouldn't harm us, but eventually they drove us out and burned our houses." Begum, 30, fled with her daughter to the coast where hundreds of Rohingya waited to cross the Naf River dividing Myanmar and Bangladesh. Myanmar state media said the fleeing Rohingya had left "of their own accord" despite assurances they would be safe. "I wanted to stay in my village," Hasina Khatum, 25, told AFP in the coastal border town of Shah Porir Dwip. "They (local officials) said 'don't go to Bangladesh. Everything will be fine'. We believed them, but nothing improved. Eventually we had to leave." The influx began after August 25, when attacks by Rohingya militants spurred a ferocious Myanmar army crackdown that the UN says amounted to "ethnic cleansing". Myanmar's government refuses to recognise the Rohingya as a distinct ethnic group and considers them illegal migrants from Bangladesh. Nurul Amin, who arrived Sunday after the military ordered his village be evacuated, described a long column of Rohingya civilians growing in size as it snaked toward the coast. "As we left, people from villages all around us started joining. They (the Myanmar army) weren't killing anyone, just burning houses," he told AFP. Thick plumes of smoke could be seen from Bangladesh rising beyond the border on Tuesday. An EU delegation in Rakhine earlier this week urged an end to the violence after seeing "villages burned to the ground and emptied of inhabitants". Amin said there were just "two, maybe three families in hiding, but no houses" in the villages surrounding his razed home in Maungdaw. "They too will come in time," he said. Rohingya refugees arriving in Bangladesh amid a fresh exodus from strife-torn Myanmar have described whole villages being emptied and thousands marching to the border as security forces redouble efforts to drive the remaining Muslims from their homes.